The name of a Talmudic treatise in Seder Neziḳin ("damages"), the fourth in order of the six "sedarim" of the Mishnah. In the Mishnah edition it occupies the tenth and last place in the "seder"; in the Babylonian Talmud the ninth place, in the Jerusalem Talmud the eighth. The treatise has gemara in both Talmuds. It consists of three chapters in the Mishnah and of two in the Tosefta, and treats of the special sin-offerings to be brought by the community, the anointed priest, and the "nasi" (ruler) for sins committed unwittingly. The Biblical law (Lev. iv.) distinguishes, with regard to the kind of sacrifice and the manner of offering, between a private individual, an anointed priest, a nasi, and an entire community. A private individual who transgressed a commandment unwittingly ("shogeg") was required to offer a female kid, a prince ("nasi") a male kid, and an anointed priest or a community a ram. Various forms connected with the offering of the sacrifice are also prescribed for each case. The discussion of these laws occupies the greater part of the treatise. Ch. I. Sacrifice for Unintentional Sins. The special communal offering may be brought only when the sin was committed in accordance with an erroneous enactment passed by the higher court. Maimonides (introduction to commentary on the mishnah of this treatise) sums up the conditions necessary for the bringing of such a sacrifice, found in the first and second chapters, as follows: (1) the head of the Sanhedrin and all its members must have been present when the decision was rendered; (2) every one of them must have been fully qualified to serve as a member of that body; (3) the decision must have been passed by a unanimous vote; (4) the error must concern a Biblical law; (5) at least a majority of the people must have followed the decision in practise; (6) those who followed the decision in practise must have been unaware of the mistake, and must have supposed that they were acting in accordance with law; (7) the error must have been due merely to ignorance of a matter of detail, and not to ignorance of the existence of the whole Biblical law in question. Unless these conditions are present every one of those who has acted in accordance with the erroneous enactment must bring an individual offering. The anointed priest who had interpreted some Biblical law erroneously and had acted accordingly was required to bring a special sacrifice. The same conditions that governed the case of an erroneous enactment of the court with regard to the practise of the community governed also the erroneous decision of the anointed priest with regard to his own practise. The laws regarding the special sacrifice of the nasi are also discussed in this chapter. In the cases of the anointed priest and the nasi, whose tenure of office is temporary, a question might arise as to the kind of sacrifice they must bring for sins committed before entering upon their respective offices, or after relinquishing them. If the sin was committed before they assumed office, they were both regarded as private individuals, and were obliged to bring a female kid. If, however, the sin was committed after they had relinquished their offices, the nasi was regarded as an individual, while the status of the anointed priest was unchanged. After the Mishnah has defined the term "anointed priest" and determined his position in the Temple, it enters upon a discussion of matters of priority — as between man and woman in cases of charity, or as regards the return of a lost object. It then enumerates the various castes among the Jews and their order of priority with regard to the calling up to read the Law, etc. 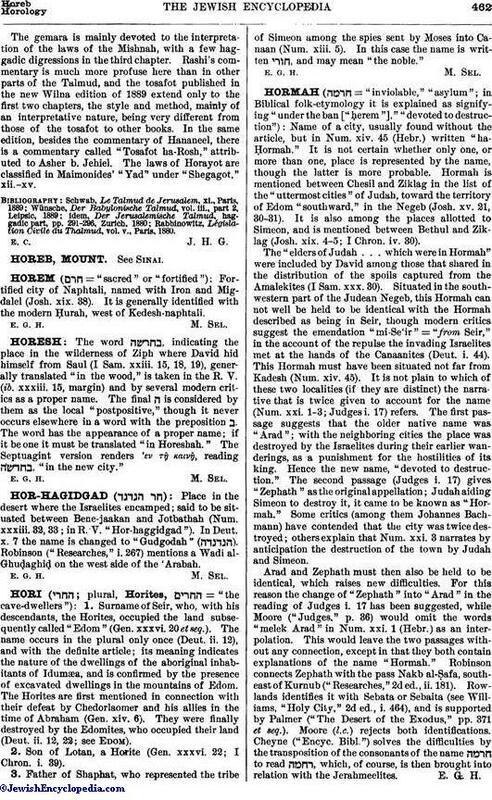 — priests, Levites, Israelites, illegitimates, "netinim" (the Gibeonites), proselytes, and freed slaves. In conclusion, the following significant remark is made: "This is only when all other things are equal, but in the case of an ignorant priest and a scholar who is an illegitimate, the latter must precede the priest in all honors." The gemara is mainly devoted to the interpretation of the laws of the Mishnah, with a few haggadic digressions in the third chapter. 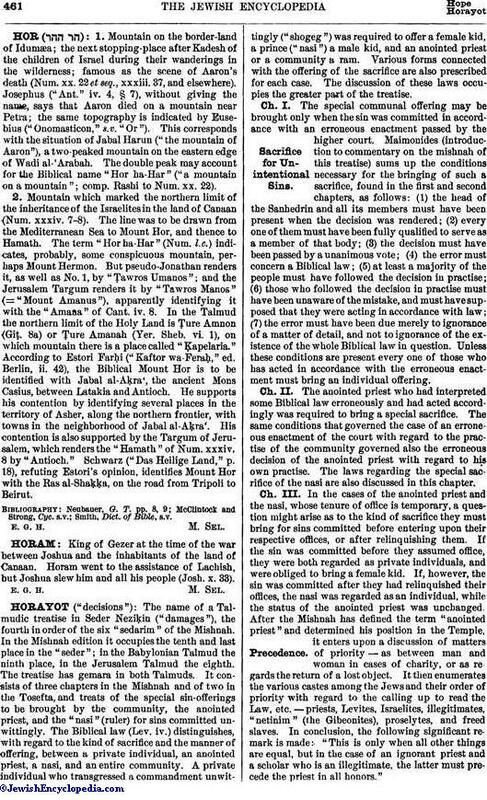 Rashi's commentary is much more profuse here than in other parts of the Talmud, and the tosafot published in the new Wilna edition of 1889 extend only to the first two chapters, the style and method, mainly of an interpretative nature, being very different from those of the tosafot to other books. In the same edition, besides the commentary of Hananeel, there is a commentary called "Tosafot ha-Rosh," attributed to Asher b. Jehiel. The laws of Horayot are classified in Maimonides' "Yad" under "Shegagot," xii.-xv. Rabbinowitz, Législation Civile du Thalmud, vol. v., Paris, 1880.